dance.net - Geraldine Taylor for Senior Lady $1400 (10245087) - Read article: Ballet, Jazz, Modern, Hip Hop, Tap, Irish, Disco, Twirling, Cheer: Photos, Chat, Games, Jobs, Events! 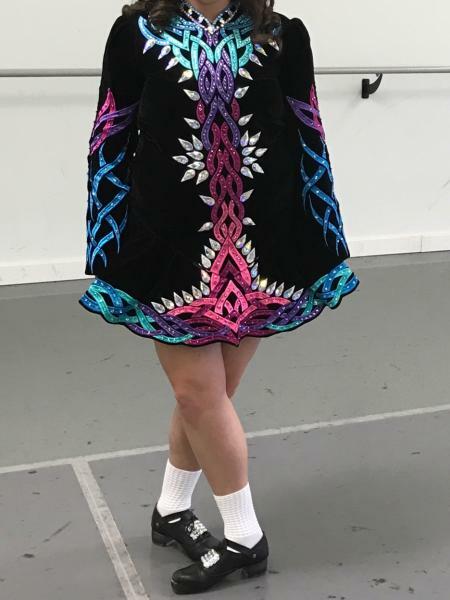 Very colorful Geraldine Taylor dress made for 2016 Nationals. Colored embroidery is completely covered with colored Swarovski stones and over 6 dozen large tear drop rhinestones. Very comfortable and easy to dance in and eye catching on stage! Asking $1400, but will accept offers. Buyer to pay shipping if outside US. Absolutely love the dress, however a bit out of our price range. We are in Australia and looking at buying my daughter her first solo dress. She is a size 14-16 and it is very difficult to find dresses in this size. Would you have any other dresses that your wishing to sell? Jazziesmom, I sent you a PM re a dress that may work and in your budget.